The busiest event in the retail calendar is coming. Here's how to get the best Black Friday deals. Black Friday and Cyber Monday may seem a way off, but shops and consumers are already planning for the busiest event in the retail calendar. The peak trading weekend will be upon us in no time, and the Black Friday deals will soon be coming in thick and fast. But what can we expect this year? And how can you get the best Black Friday deals on creative gear? Let's find out. When is Black Friday and Cyber Monday 2019? First up, you need to mark these two dates in your diaries. 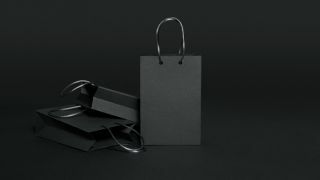 Originally started in the US, Black Friday traditionally takes place on the Friday immediately after Thanksgiving, meaning this year it falls on the 29 November. Cyber Monday is the 2 December this year, three days after Black Friday. While Black Friday is a frenzied cacophony of high street and online deals, Cyber Monday was originally conceived by savvy marketers as a way to sell more of their wares online, back when online shopping wasn’t as prevalent as it is today. According to those in the know, Cyber Monday sees a wider range of deals across individual retailers. It's less about one-off discounts, and more about lower prices generally. Of course, if stores need to shift stock they’ll follow up Black Friday discounts with further reductions on Cyber Monday – so expect one-off deals too. With Black Friday and Cyber Monday happening a little later this year, it may well be a good opportunity to get your Christmas shopping sorted in one fell swoop. Where will we see the best Black Friday and Cyber Monday deals? While we can't say for sure where and what the best Black Friday deals will be, we can make educated guesses based on previous years. It's wise to keep an eye on any sought-after items throughout the whole of November, because we've been seeing Black Friday deals starting to surface earlier and earlier each year. However, the best deals have historically happened later in the month, with retailers offering bigger discounts on the most expensive items, as well as accessories that might go with them. And typically, the best bargains are still reserved for Black Friday and Cyber Monday themselves. So what kind of items are we talking about? Here are our top predictions on the creative items you might have on your Christmas list this year. Last year, creative software giant Adobe got stuck in all the Black Friday deals action, offering up to a whopping 40 per cent off a subscription to its Creative Suite of apps. That meant new subscribers could up Adobe’s entire collection of 20-plus creative desktop and mobile apps, and more, for just £30.34/€36.29/$22.99 a month, instead of £49.94/€60.49/$52.99 a month, which is the cheapest offer we ever see from Adobe. That said, Adobe has offered other discounts throughout the year, albeit not quite as impressive as that. Right now is one of those times too, with the company currently offering those residing in Europe between a 20 and 40 per cent discount (depending on where you live) on the full CC suite (offer ends 19 April 2019). Everything suggests Adobe will get involved with Black Friday 2019, but we have no firm confirmation of that so for those of you in Europe, grab the deal here while you still can! Apple has been busy this year, launching its new iPad Mini and iPad Air. With both now offering Apple Pencil support, these models are a great choice for busy creatives on the go. As shiny new additions to Apple's portfolio, we don't expect to see hugs savings on these, but if there are any discounts to be had, we'll keep you posted. But the best deals will almost certainly be on older – but still very sought-after – iPad models. For example, last year saw the iPad (2018) reduced to the bargain price of just $249 at Walmart, and it, unsurprisingly, flew off the shelves. If you're after a bit more power, the iPad Pro (2017) was reduced to $524.99 (from $649) at Walmart last year too. Whatever iPad model you're after, we have details of all the best iPad deals right now and will update as the best Black Friday deals drop. If it's an iPhone XR you're in the market for, there's an XR sequel due later this year, meaning the ever popular 2018 model will likely see some pretty impressive savings. It's worth noting that these discounts will come from retailers, rather than directly from Apple, which tends to only extend its Black Friday involvement to that of extra Apple gift cards when you make a purchase. It's a firm favourite among creatives, but the MacBook Pro doesn't come cheap. So it's no surprise that a load of them got snapped up last year when B&H dropped the 2017 15.4-inch model to $2,149 (from $2,799). It may not be the newest version, but the MacBook Pro 2017 is still a highly capable and powerful machine. It's rare to see big savings like this on the latest Apple products, but if you're not worried about having the most up-to-date specs, you can save an absolute packet, and grab a great bit of kit while you're at it. Rounding up our Apple products Black Friday review is the company's controversial Airpods. Some people love them, others think they look weird/want the headphone jack back. Whichever camp you fall into, there's no denying that the Airpods are highly capable headphones. Last year, the biggest discount we saw was around £20/$30, which is hardly worth it really. However, with the new improved Apple Airpods (2019) out now, we're hopeful we'll see much better Black Friday Airpod deals in November. We'll keep you updated with any great deals that land, so make sure to bookmark this page and check back nearer the time. Will there be any Black Friday deals to be had on the new Wacom Cintiq 16? Here's hoping. It's notoriously difficult to find a discounted Wacom product, which is why Black Friday 2018 was such a pleasant surprise for designers in the market for one. Various retailers dropped the price of Wacom's sought-after products, the best Black Friday deals seeing a whopping $200-$500 knocked off the popular Cintiq Pro range. Wacom has recently released its budget Wacom Cintiq 16. It'll be interesting to see if any Black Friday deals crop up on this already affordable creative pen display. In a similar vein to Apple, it's very rare for Wacom to offer discounts directly – if you want to make a saving, you're best looking at major retailers such as Amazon or Walmart. Alternatively, if you're on the hunt for a graphics tablet, but don't mind if it's not a Wacom, last year there were some great bargains on XP-Pens, so that could be one to watch out for. Better still, save yourself the hassle, bookmark this page and we'll bring you all the best graphic tablet deals right here. OK, so it's not exactly the sexiest of items, but an external hard drive can form a vital part of a designer's toolset. And, as anyone who has one will attest, they don't come cheap. Last year, leading manufacturer Western Digital offered some decent savings on its 'My Passport' range, which for its 4TB option starts at around £90. We'll be keeping you up to date with any Black Friday deals that drop as and when, but if you need one before then, take a look at our best external hard drives guide, where you'll find all the lowest prices. Look out for more Black Friday information and deals coming soon!